Night 5 already. I’ve put on a pound or two from the latkes, and lets face it, from this marathon of beer. I’m quiet for months at a time, and now I’m in the middle of my annual #8BeersOfChanukah craziness. Normally we write about Ontario produced beer. But this is Chanukah so I break the rules and go a little rogue, and tackle all the fun things in my fridge. Most years I make a spectacle of going to the Summerhill LCBO and spending an afternoon curating the list. This year, you get a hodgepodge of whatever I feel like drinking cause that’s how I roll. 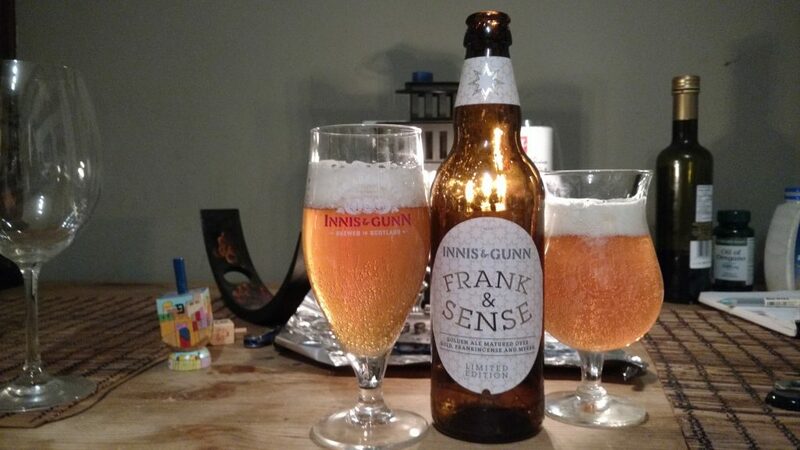 Enter a Scottish brew in honour of Kole’s Scottish heritage, Frank & Sense by Innis & Gunn. They send us beer every now and then, and I never honestly figured out why since we don’t really cover imports. But thanks for the delivery, beer fairy! This one came from their rep, and a 500 ml bottle retails for $7.95 at the LCBO. Why? Cause it’s matured over gold, dammit. Gold, frankincense and myrrh. I really hope 3 very wise men delivered this to my home, bearing gifts of gold, frankincense and myrrh cause that would really add to it. This is a limited edition release. I thought it was fitting to enjoy it in Kole’s Innis & Gunn glass, a relic from our first Christmas together when I was busy trying to teach him about beer. I got him one of those gift packs with 3 assorted Innis & Gunn bottles and a glass. What do you get a guy that you’ve only been dating a few months, anyhow? Appearance: Golden colour, filtered, highly carbonated, with a lasting frothy white head. Aroma: Pizza crust, bruised apples. Taste: Palate is much stronger than the aroma. Metallic taste dominates – reminded me of a copper penny? Lingering baking spices. So my notes just have the word myrrh underlined a bunch of times. Aftertaste: Fairly grassy from the hops. Really balances the myrrh. Suggested food pairing: Tabouleh salad, Moroccan tagine or scotch eggs. You know, traditional Chanukah foods here. Obviously. Overall: Drink this with 3 wise men as you flee persecution in the desert. Wait. Wrong biblical storyline for Chanukah. Split it with your 3 wisest uncles. Shawna is a 30-something Montreal native transplanted to Toronto in 2010. Wine loving, beer sniffing and rum swilling come naturally to her, and she is also a certified Irish whiskey taster. She has hosted beer and cheese pairing events in the past. Shawna has visited vineyards in 6 countries on 3 continents, and has a knack for finding the hoppiest beers around. A dedicated Booze Hound, Shawna completed the Wine Specialist Certificate at George Brown College in 2018. She can be found drinking alka-seltzer and coconut water in the morning.